A mention of Conneaut Lake Park in last month’s blog by Irene Caldwell O’Neill reminded me of a couple of lively and colorful amusement parks we used to visit in the 1950s and 60s — when we had willing friends, access to a car and some money to spend. If descriptions of these amusement parks stir up some memories of your own, please consider sharing them with us. Surprisingly Conneaut Lake Park is still in operation after over 120 years since it began. Like its signature Blue Streak wooden roller coaster, the park has had ups and downs throughout its history, from fires to closures to bankruptcy. It is currently overseen by a not-for-profit corporation. Originally a boat landing, the land was purchased by the Conneaut Lake Exposition Company which created “Exposition Park” in 1892. It operated as a permanent fairground showing Western Pennsylvania’s finest livestock and latest machinery and industrial products. Beginning in 1901, new owners — the Pittsburgh & Shenango Valley Railroad — turned it into a popular resort that included several hotels and was accessed by boat, train or a trolley. “Conneaut Lake Park,” renamed in 1920 after Pennsylvania’s largest glacier lake, featured the rides and amusements we knew in the 1950s: the Tumble Bug, Tilt-a-Whirl, Wild Mouse, Jack Rabbit, and the Blue Streak (2,900 feet long, 51 mph speed) which was added in 1938. (Source: Wikipedia.org). Most of these rides are still in operation, including the 77-foot high Blue Streak, known as the 17th oldest existing wooden rollercoaster in the United States. That the park hadn’t changed much through the years added to its charm and attraction. About 30 miles from Sharpsville, it was a favorite destination for a Saturday night double date. In the 1950s we didn’t think much about the park’s early days when women in Gibson-girl hairstyles and flowing ankle-length dresses and men in blazers and straw hats arrived on trolleys to enjoy a day at the park. We were seeking the same pleasures, however, daring each other to try the fastest, highest or jerkiest rides or enjoying a bright red sticky candy apple or similarly sticky cotton candy and strolling the park to see and be seen. For me, the rides were more fun to watch than actually ride, the penny arcade and the funhouse being more my speed. The funhouse had two fascinating mirror features: a room full of mirrors that would cause a great amount of disorientation, as well as a tall wavy mirror at the entrance that would distort your reflected body into various shapes depending on where you stood. Out in front, too, was a huge figure of a laughing lady, whose recorded laugh was loud and monotonous but definitely attention-getting. One quaint machine in the penny arcade was called the “peep show,” albeit quite innocent in nature. Once you inserted a penny and looked into a small opening, you would see a set of picture cards on a rotating axis. When you turned a handle the cards flipped by fast enough to suggest that the pictures were in motion. I recall scenes such as a woman dancing or a man lifting weights. Since the figures were in early 1900s attire, they were obviously a leftover from the park’s earliest days, just as the penny arcade itself was a precursor to the video arcade of more recent times. In our day, we didn’t have just one amusement park close by, we had two. Across the Pennsylvania-Ohio border was Idora Park, located a little over 20 miles southwest of Sharpsville. “Youngstown’s Million Dollar Playground” was built by the Youngstown Park & Falls Street Railway Company. Like Conneaut Lake Park, it was one of many amusement parks that were built at the end of trolley lines to “generate weekend revenue,” according to Wikipedia.org. Soon after opening, it became known as “Idora Park” as the result of a naming contest. 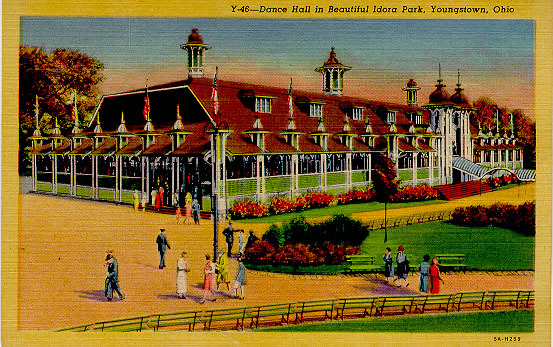 I still remember Idora Park Ballroom, a large red building with an expansive hardwood floor on which people danced to the music of big-name bands and, later, attended rock and roll acts such as the Eagles and The Monkees. When we weren’t hanging out at the ballroom, we crashed into each other with bumper cars, took a dizzying ride on the merry-go-round (which was added to the National Register of Historic Places in 1975) or tried out the roller coasters. This park had two wooden roller coasters. The Wild Cat was built in 1929 as a 3,000-foot state-of-the-art, three-minute ride and “was still ranked among the top ten roller coasters in the world in 1984.” Also recognized at the time as one of the best coasters in the country was the Jack Rabbit, 70 feet in height and 2,200 feet long, built in 1910. I’ve never forgotten how scared I was when one of the rides would always end by racing down a track and splashing into a pool of water. We would leave the ride not only in an unsteady state but dripping wet. The park survived until the 1980s when several changes brought about its final demise: the end of the Youngstown Sheet and Tube, the city’s biggest employer, and a devastating fire in 1984. Under the mismanagement of subsequent owners, the park suffered additional fires and continuing deterioration until the remaining structures were razed by the city. Only the carousel remains to this day, purchased and restored by a couple in New York City and now on display in the Brooklyn Bridge Park. 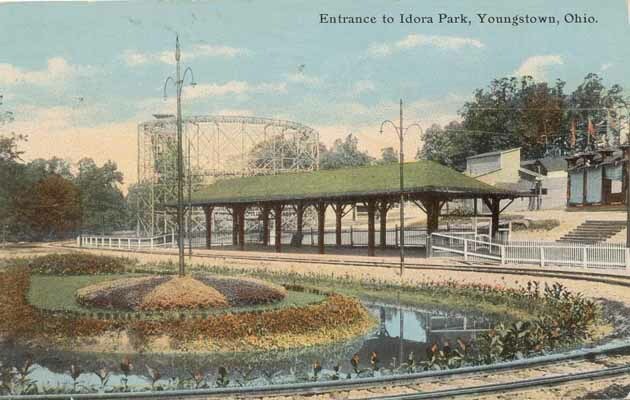 For more about Idora Park’s early days and great vintage photos, see “The History of Idora Park (1899-1984)” by Rick Shale at Mahoning Valley Historical Society’s site. Today, the pungent odor of hot dogs slathered with mustard, catsup, pickle relish and onions or the cheerful music of a calliope still bring back memories of the simple enjoyment of a visit to Idora or Conneaut Lake Park.